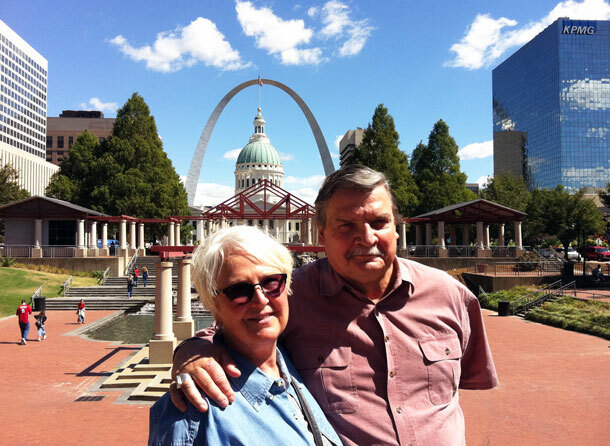 We have both lived in St. Louis and when we return we often go downtown to visit familiar sites, including the Gateway Arch. The tallest monument in the United States and a symbol of the city, the stainless-steel Arch soars 630 feet above the Mississippi River. Designed by famed architect Eero Saarinen and completed in 1965, this engineering feat commemorates the city’s impact on westward expansion as the storied Gateway to the West. Established in 1764 by the French along the mighty river just below its confluence with the Missouri River, St. Louis was named for Louis IX, patron saint of the reigning monarch of France Louis XV. From its beginning, the city acted as a commercial center on the edge of the frontier, attracting merchants, steamboat captains, beer barons, and railroaders. It was also a jumping-off place for adventurers, fur trappers, soldiers, and sodbusters. Citizens, including some of our ancestors, were proud that their city was a key crossroads and a leading industrial and transportation hub. As the nineteenth century drew to a close, St. Louis—tempered by political upheaval, social conflict, cholera epidemics, and waterfront fires—emerged as one of the largest and vibrant cities in the United States. Although it had been founded by the French and, for a time, was governed by the Spanish, St. Louis became the melting pot of cultures and customs. The population swelled with waves of Germans, Italians, Irish, and African Americans, all of who left their distinctive marks. It often was said that the whole world passed through the old river city.